Arctic Shipping: Not If, But How Much? 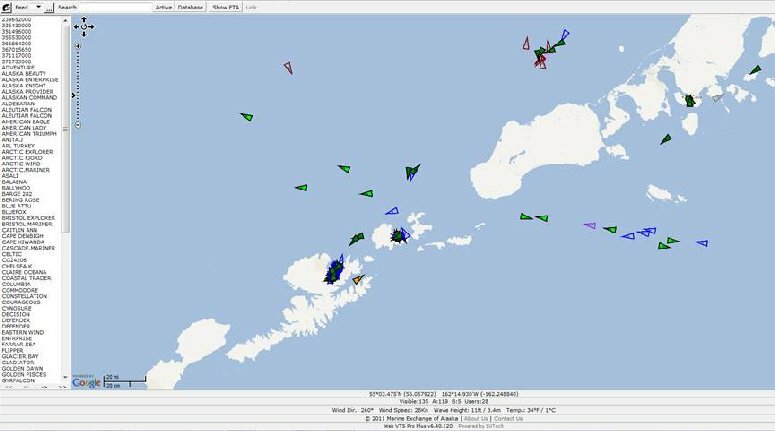 Marine Exchange of Alaska vessel tracking system example display. Originally titled “Arctic Shipping: Not If, But When?” the panel discussion was appropriately renamed to reflect increasing activity and the current presence of almost 100 vessels in the Arctic. “Over 95 vessels are operating in the U.S. Arctic right now”, Margaret Spring of the National Oceanic Atmospheric Administration reported at the Arctic Imperative Summit. Are we ready? Listen to representatives from NOAA, Alyeska Pipeline and Marine Exchange of Alaska discuss “Arctic Shipping: Not If, But How Much?” on first of four Addressing Alaskans programs recorded at the Arctic Imperative Summit . Admiral Thomas Barrett, President, Alyeska Pipeline Service Co.
Watch complete panel discussion including speakers: Felix H. Tschudi, Chairman and Owner, Tschudi Group; The Honorable Shirley Marquardt, Mayor, Unalaska, Alaska; Rudy Tsukada, President, Aleut Enterprise HERE. BROADCAST ON KSKA: Thursday, October 4, 2012 at 2:00 p.m.
REPEAT BROADCAST: Thursday, October 4, 2012 at 7:00 p.m.